Venkatalakshmi, is about 60 years. 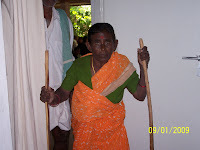 All but crippled because of her Osteoarthritis, she is dependent on two sticks to help her walk. She finds it impossible to go about her daily functions. NSAIDS (Painkillers) and Calcium tablets alleviate the pain to some extent. Her treatment is being funded by the Village Development Council, London. Bavaji: July 2008 and January 2009. 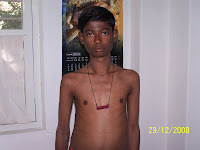 A patient of Severe Thyrotoxicosis, who with treatment has shown dramatic improvement. The two photos say it all. 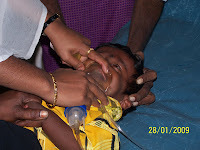 Pavan Kalyan, 18 months, had a broncho pneumonia. Use of Nebuliser and additional oxygen, as an outpatient procedure ensured that he survived. Ideally he should have been have been hospitalised, but lack of money, meant that we had to treat him at the RHC. Thanks to Dr Ramesh for seeing him through. His treatment was funded by Heart and Hand for the Handicapped, USA.